Supernatural 12x10 "Lily Sunder Has Some Regrets"
For anyone looking for a Castiel/angel-centric episode, look no further. Yes, we took a break from the main storyline.... well. 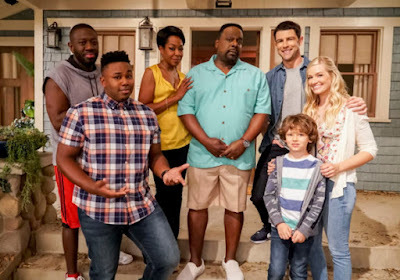 What IS the main storyline? Maybe we didn't take a break from it after all. As promised, it doesn't seem like there is really a big bad this season, other than perhaps the British Men of Letters, Lucifer stuff, and Mary being around. Anyway! Back to this episode. 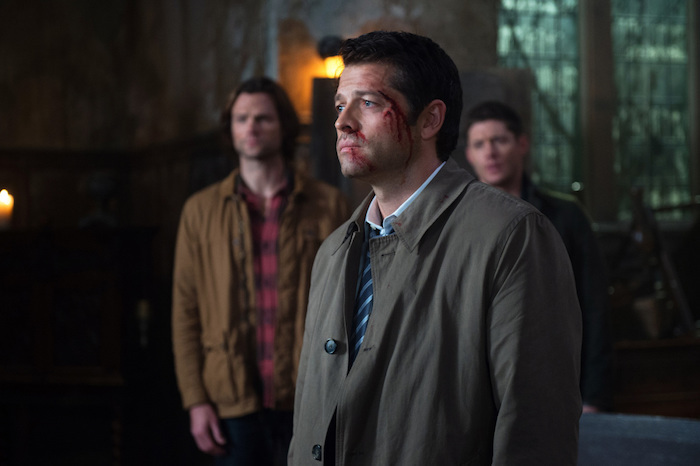 Dean is miffed at Castiel for messing with the order of the universe by killing Billie. Which I call a rather huge case of hypocrisy given how much the Winchesters have done just that. I mean really? Where does he get off lecturing Cas about that sort of thing? Do we not remember how they got rid of the Mark of Cain? That has to take a backseat for the main story of the night, though. A angel that used to be in Castiel's regiment, Benjamin, was killed. He wants to find out who did it, so he meets up with some other angel friends of his who were in the same battalion. Turns out, Benjamin was not the first, some others had been killed as well. So why did Cas not feel those deaths? Whatever! 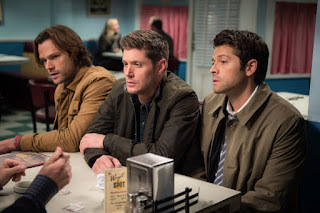 When said murderess shows up at the very diner that Cas (along with Sam and Dean) are meeting with Ishim, they realize they know her. She seems to have some kind of issue with the angels, as she only goes after them and tells the brothers that she doesn't have any problems with humans. The brothers make the angels fess up to what happened, in order to better try to solve the problem. Turns out, Lily was alive back in the early 1900s, in a relationship with an angel, who fathered her child. Since Nephilim are prohibited, the group of angels came to take care of it. Now Ishim believes she is using some kind of demon deal or something to stay alive and have these powers. Because, you know, angel powers don't really work on her. Sam and Dean go off to reason with her, since they're human and she's human and they can explain that the angels have changed now, ie they care more about people. Things aren't quite so simple, though, because she tells them what really happened. Her daughter was not a Nephilim, she'd had her before the relationship with the angel. She was only with that angel because she was trying to protect herself from Ishim. See, she was the foremost human expert on angels, and figured out how to summon one, which turned out to be Ishim. He became obsessed with her, and she could only get away from him by having this other angel dude come, or something. Anyway, Ishim got pissed and made up the story about the kid in order to get revenge on her - to break her heart the way she had broken his. Dean goes back to tell Castiel the truth while Sam stays and hangs out with Lily, who informs him that she's not using dark magic, but rather figured out how to use angel magic, though it does slowly consume her soul the more she uses it. Sam knows a bit about being soulless, and soon realizes she's just kind of hanging around waiting for Ishim to kill Dean so Sam will be on her side. Not so fast, lady! Indeed, Ishim is trying to kill Dean, and Castiel isn't much help in preventing that, as he used a lot of his energy to heal Ishim from Lily's earlier attack. Luckily, Sam and Lily show up just in time. She uses this special eye orb thing to angel light him long enough for Cas to stab him with the angel blade. He also apologizes for his earlier ignorance and understands if she still wants to go after him. She puts away her revenge, at least for now, while the boys head back to the bunker to drink and contemplate whether they should actually kill the spawn of the devil or not. - How much do we wanna bet that using angel magic is going to come back up somehow? Also, how did no one know that was possible before? It seemed like the angels were completely unaware of it as well. - Also, would using that much angel juice there at the end not have used up the rest of Lily's soul? We know what happens when people don't have souls. It's not pretty. - The title of this episode is much more flip than the tone of the episode itself. Odd choice. Sam: I don't think we have the kind of mom that's going to stay home and make chicken soup for dinner. Castiel: You know what I like about him. He's sarcastic, but he's thoughtful and appreciative too. Sam: And you're gonna storm in, right.....now. Castiel: These are my friends. My friends who don't listen very well. Lily: Patience is a talent. You'd be amazed what a person can do with a little bit of purpose and an abundance of time. Thanks for the comment! Yes, I agree that angel continuity has really been lacking. Every episode I'm wondering what powers they're supposed to still have and who else their angel blades can kill. Surprised you didn't have "Good Old Angel Radio" in quotes. That made me laugh. GREAT review btw!! I think one of my favorite moments was Dean asking Cas (about Ishim), "Why do you let him talk to you like that?" Ha, yes, Dean is not entirely self aware!